Joel's Jottings: Shalom or Salaam. Don't they both mean, Peace? There are two sides to every story they say. But the two most difficult sides to argue for-or-against today could well be the Israel and Palestinian sides. Monday’s (Oct 18, 2011) prisoners-swap deal between the two countries saw a great furore across the Middle East and the world. The release of the Israeli soldier Gilad Shalit by Palestine, in exchange for 477 Palestinian prisoners held by Israel is a very significant development in the long ongoing bitter struggle for land by the two warring peoples. Israel’s promise through an accord – brokered by the Egyptian government - to release 1,027 prisoners in exchange for the French-Israeli national Gilad Shalit has begun with this first batch of 477 prisoners. And the other 550 are likely to be released soon. Some would argue that there is an imbalance. 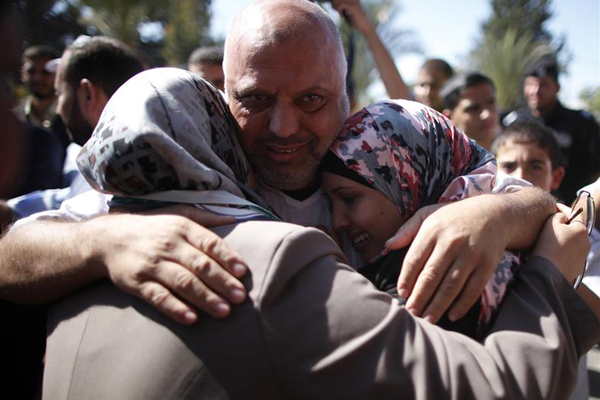 Why are so many Palestinian prisoners released in exchange for one Israeli man? Is it a fair deal? While we do not know about all the negotiations that must have gone on between the two - through Egypt’s mediation - what we do know is that some 5,000 Palestinians are still held by Israel. And, if Gilad Shalit has been held for 5 years, then some of the 477 released who were held for as long as 20 years to 30 years. And, even if some of these Palestinian prisoners were caught by Israel on suspicion, or on grounds that they had infiltrated into Israel to perpetrate terror crimes, it must be noted that many were held without proper trials. And the very detention of these people for such long periods is tantamount to their experiencing a long jail sentence. So, it is high time they were released. Some Israelis are, somewhat justifiably, arguing that their government has been lenient. That it is just not right for Israel to release some of those Palestinian prisoners who had shown no remorse on being caught with incriminating evidence of terror, and who had actually vowed to attack again. Some Palestinians are jubilant at the release of their compatriots and are chanting that they need to catch more ‘Gilads’ so that many more Palestinians, languishing in Israeli jails, could be freed. So, with the release, will there be a renewal of terror? Or will there be a resumption of talks? I hope it’s not the former but the latter. On one hand, the Palestinians are seeking UN recognition of Palestinian Statehood, and are refusing to talk unless the Jewish settlements are stopped, and unless they are given the pre-1967 borders. On the other hand, Israelis are refusing outside interference, even from UN, in what they say is a bilateral issue, and are asking Palestinians to renegotiate on borders and assure them security. Whichever way it goes, the prisoner-swap deal is certainly an historical event. And we can safely infer that it has the markings of Benjamin Netanyahu’s strategy and softening at the same time. Shalom or Salaam. The meaning is the same. Peace. And if it is not for ‘Peace on earth and goodwill to men’ what is worth striving for?